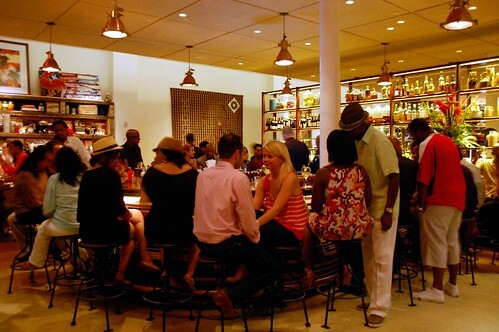 Mr. Monkey and I were very excited to eat at Chef Marcus Samuelsson's Red Rooster in Harlem. I became a big fan after watching Chef Samuelsson win Top Chef Masters. Mr. Monkey became a big fan after we met Chef Samuelsson at last year's Barbados Food & Wine and Rum Festival. He was easily the most personable chef at that event. 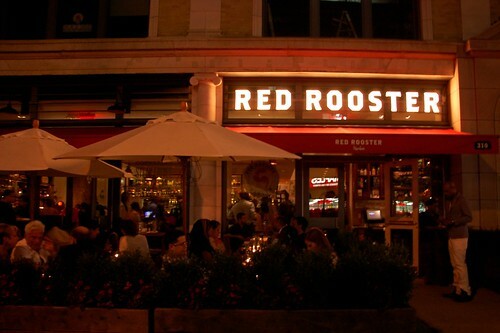 Red Rooster is very much a reflection of Chef Samuelsson himself, a happy Harlemite with Ethiopian roots and a Swedish upbringing. 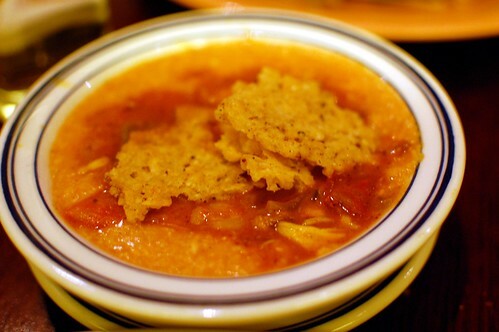 The food is decidedly Southern but includes ingredients, spices, and tastes from around the world. We had a delightful time. I've read a number of unfavorable reviews, and I'm baffled. Everything we ate was marvelous, and our bill was rather reasonable by New York standards. My only issue with Red Rooster? Photos are not allowed! The hostess berated me after I snapped the shot of the bar above. I literally had to sneak all of these food photos very quickly when staff wasn't looking. This was no easy task. 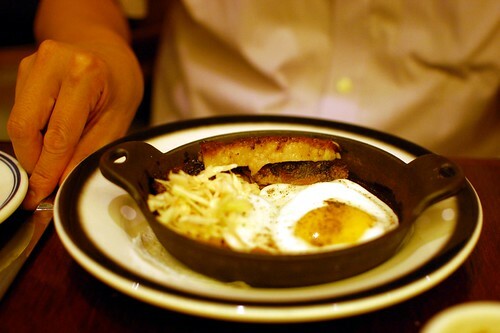 Jerk bacon and egg, brown beans, pikliz (Haitian pickled vegetables) ($16). 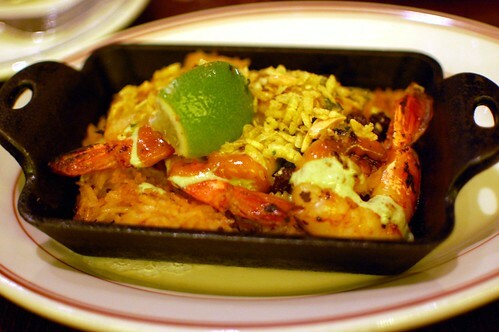 Dirty rice and shrimp, aged basmati, curry leaves, almond ($13). 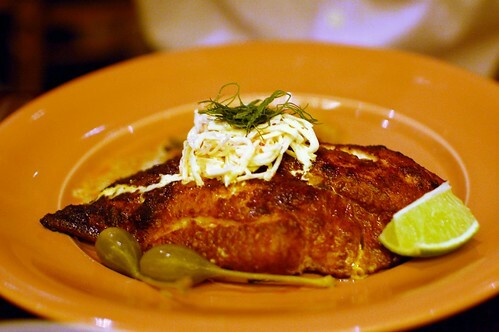 Blackened catfish and black-eyed peas, fried pickles, lemon dill slaw ($23). Creole red grits, crab, shrimp, chorizo ($10). 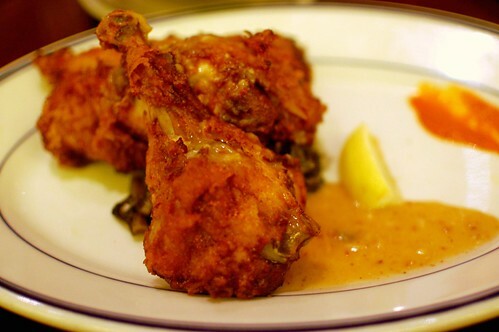 Fried Yard Bird -- dark meat, white mace gravy, hot sauce, shake ($22). 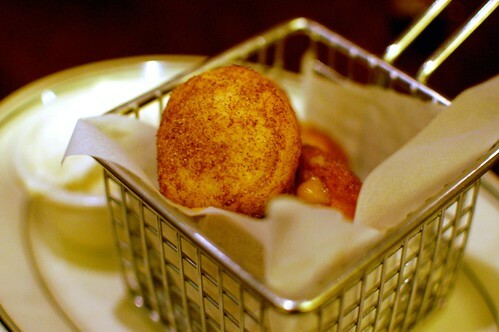 Sweet potato doughnuts, cinnamon sugar ($8). The flavors were really strong and interesting throughout the meal. My illicit photography doesn't do Red Rooster justice. This meal made us even bigger fans of our dear Marcus. Hahaha love you were still able to get a shot of everything. Did they say why photos were banned? I've never tried one of Samuelsson's restaurants but I really want to. I totally don't get the banning of photos. Everything looks delicious. . . But I'm still a little disappointed. I glanced at the title too quickly and thought you were finally going to review Red Lobster. The Captcha for my prior post was "dolor" and now I'm escare. Have I been cursed? Wow looks so good! Love the flavor combinations. Ditto the Red Lobster comment. But then I thought, "No, weezermonkey doesn't eat there."